In 9th century Spain, Muslim inventor Abbas ibn Firnas designed a flying machine -- hundreds of years before da Vinci drew plans of his own. London, England (CNN) -- Think of the origins of that staple of modern life, the cup of coffee, and Italy often springs to mind. The origins of these fundamental ideas and objects -- the basis of everything from the bicycle to musical scales -- are the focus of "1001 Inventions," a book celebrating "the forgotten" history of 1,000 years of Muslim heritage. "There's a hole in our knowledge, we leap frog from the Renaissance to the Greeks," professor Salim al-Hassani, Chairman of the Foundation for Science, Technology and Civilisation, and editor of the book told CNN. "1001 Inventions" is now an exhibition at London's Science Museum. Hassani hopes the exhibition will highlight the contributions of non-Western cultures -- like the Muslim empire that once covered Spain and Portugal, Southern Italy and stretched as far as parts of China -- to present day civilization. Around the year 1,000, the celebrated doctor Al Zahrawi published a 1,500 page illustrated encyclopedia of surgery that was used in Europe as a medical reference for the next 500 years. Among his many inventions, Zahrawi discovered the use of dissolving cat gut to stitch wounds -- beforehand a second surgery had to be performed to remove sutures. He also reportedly performed the first caesarean operation and created the first pair of forceps. Now the Western world's drink du jour, coffee was first brewed in Yemen around the 9th century. In its earliest days, coffee helped Sufis stay up during late nights of devotion. Later brought to Cairo by a group of students, the coffee buzz soon caught on around the empire. By the 13th century it reached Turkey, but not until the 16th century did the beans start boiling in Europe, brought to Italy by a Venetian trader. "Abbas ibn Firnas was the first person to make a real attempt to construct a flying machine and fly," said Hassani. In the 9th century he designed a winged apparatus, roughly resembling a bird costume. 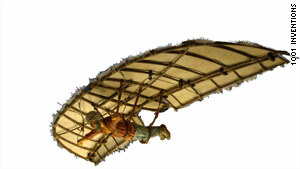 In his most famous trial near Cordoba in Spain, Firnas flew upward for a few moments, before falling to the ground and partially breaking his back. His designs would undoubtedly have been an inspiration for famed Italian artist and inventor Leonardo da Vinci's hundreds of years later, said Hassani. The word algebra comes from the title of a Persian mathematician's famous 9th century treatise "Kitab al-Jabr Wa l-Mugabala" which translates roughly as "The Book of Reasoning and Balancing." Built on the roots of Greek and Hindu systems, the new algebraic order was a unifying system for rational numbers, irrational numbers and geometrical magnitudes. The same mathematician, Al-Khwarizmi, was also the first to introduce the concept of raising a number to a power. "Many of the most important advances in the study of optics come from the Muslim world," says Hassani. Around the year 1000 Ibn al-Haitham proved that humans see objects by light reflecting off of them and entering the eye, dismissing Euclid and Ptolemy's theories that light was emitted from the eye itself. This great Muslim physicist also discovered the camera obscura phenomenon, which explains how the eye sees images upright due to the connection between the optic nerve and the brain. Muslim musicians have had a profound impact on Europe, dating back to Charlemagne tried to compete with the music of Baghdad and Cordoba, according to Hassani. Among many instruments that arrived in Europe through the Middle East are the lute and the rahab, an ancestor of the violin. Modern musical scales are also said to derive from the Arabic alphabet. According to Hassani, the Prophet Mohammed popularized the use of the first toothbrush in around 600. Using a twig from the Meswak tree, he cleaned his teeth and freshened his breath. Substances similar to Meswak are used in modern toothpaste. "Hospitals as we know them today, with wards and teaching centers, come from 9th century Egypt," explained Hassani. The first such medical center was the Ahmad ibn Tulun Hospital, founded in 872 in Cairo. Tulun hospital provided free care for anyone who needed it -- a policy based on the Muslim tradition of caring for all who are sick. From Cairo, such hospitals spread around the Muslim world.